If you use ingredients and recipes, you can use Prep Recipes to accurately track your pre-made ingredient inventory. For example, if you prepare a large batch of soup before service, you can enable a Prep Recipe for the product. This way, the system will remove the individual ingredients from inventory as soon as the Prep Recipe is marked as prepared. If a product has a recipe and Prep Recipe is not enabled, the ingredients will be removed from inventory at the time the product is sold. Add all ingredients and quantities that comprise the recipe. View this article to learn how to add ingredients and attach recipes (link). 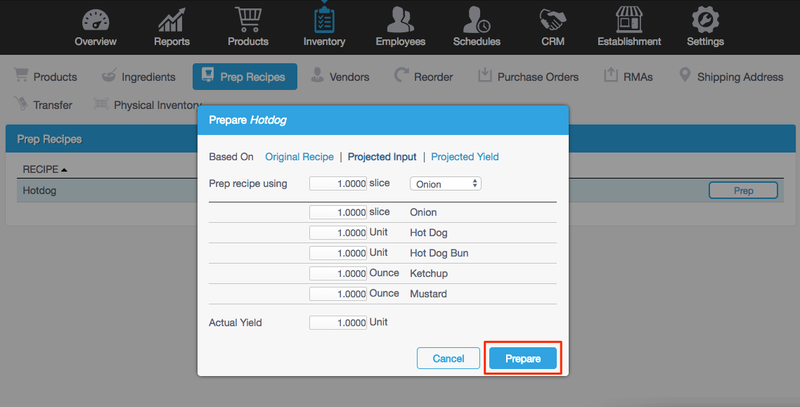 In the Management Console, navigate to the Inventory tab and click the Prep Recipes tab. You will see all products that have Prep Recipes enabled in the Products tab. When you click Prep, a new window will appear with the original recipe. Here, you can edit the recipe if needed. This will only change the ingredients in the recipe this one time. (If you want to change the recipe permanently, you will do that through the Recipes page in the Products tab.) The Projected Input and Projected Yield allow you to change the ingredient amounts and yield amount for this specific batch. Does the inventory system extend to the ingredient level?